Diane started out in floral design at age 14 in her father’s floral shop, Didier Florist in Rockford. She grew to love the trade and graduated from Bill Hixton Design School skilled in all styles of floral design. 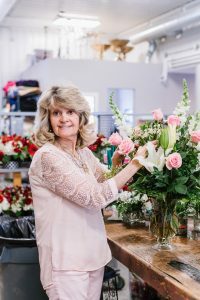 With over 35 years in design and roughly 50 in the floral business, Diane creates designs with the fuel of endless creative talent and vast experience coupled with a commitment to customer service and quality. For Event Floral, Diane specializes in centerpieces and large specialty arrangements, including funeral pieces, as well as the detailed personal corsages and boutonnieres. She is incredibly devoted to her faith, her church, and her family. Outside of the studio, she loves to spend time gardening, cooking and baking gourmet food and desserts, and arranging décor for her home and church.